Welcome back to another issue of Milk Bar Mornings! For this issue, we will be looking at songs from the various Zelda commercials that have been broadcasted. These songs have always been quirky, upbeat, and usually feature a rap or chant. We will be looking at commercials from both the United States and Japan. Like always, we will be looking at the technicalities as well as the story behind the song. So hit the jump to see what we have in store! This song is something well known throughout the Zelda world, as the strange rap that somehow managed to get hundreds of thousands of people to buy the game in the United States. 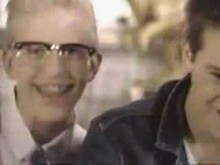 This was the series’ first commercial in the United States. The video stars two nerdy teenagers playing The Legend of Zelda as they go through a short yet catchy rap, infamous for its awfulness. The story behind the jingle, is a story of innovation. The commercial starts off one of the teenagers noticing the game in a Nintendo Newsletter (ah, the mid 80’s) and the other one stating he has it, and they pop it in, and start the rap. If you’re not sure how this is innovative, it was because nothing like this had ever been seen before. The concept of a game where the player can explore an open world was unheard of at the time, and to see it was something so mind blowing that it had caused them to take part in a cheesy rap that let out some of the wonders of the game. This commercial is well known among the gaming community as a prime example for the “different” way that Japan goes with advertising. 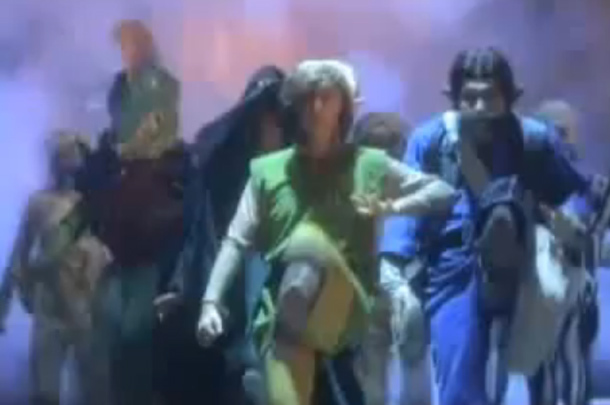 The ad is notorious for things like Link being played by a woman, Zelda being voiced by a man, and of course the eccentric dance being accompanied by the song. The song of course is a simple dance song accompanied by a rap, in Japanese of course, which drops out for a moment for the Zelda theme, only to return back to the dancing and the song. The story the dance song portrays is a story of return. The Zelda series had been on a short hiatus for four years. A Link to the Past had been surrounded by speculation, from things like wether or not it was going to appear on the NES, to wether or not a third Zelda game would even be released. But soon enough, the game was announced, and in no time, it had hit shelves worldwide. 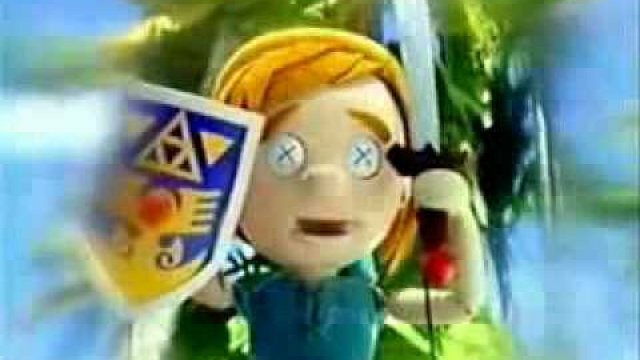 The ad reintroduces the series, while constantly chanting “deru” which means “it’s coming”, cheering on the fact that a new Zelda game will finally be out. The concept of a new Zelda game is truly something that would make anyone dance. For our final commercial, we will we be looking at another Japanese commercial, the commercial for Link’s Awakening on the Game Boy. This ad is slightly less creative, and is intentionally bad. The ad features numerous puppets with visible rods to give it a childish feeling. The puppets appear in various locations on Koholint Island as they go through their quest to awakening the Wind Fish. The song running through the song features a central chorus and, of course, a rap. The story the song portrays is a story of unfamiliarity. The game takes place in a new location, Koholint Island, rather than the usual setting of Hyrule. The ad takes the new island setting and uses it to its advantage by creating a new, more tropical feel. To accompany this new feel, the ad uses less fantasy, and focuses on a playful feel. To set this feeling in place, the song features a slightly off-beat vibe, until it reaches the rap, where it shapes into place. Through the song and new environment, a feeling of unfamiliarity is conveyed to players. But that is all for this issue of Milk Bar Mornings! Let me know what you thought of it in the comments below, and also make sure to mention what you would like next week’s theme to be! Thanks for reading!